Age-uke section of the kata. There are a number of differences between "styles" in this section, primarily due to the different angles of attack. Shorin-ryu variant the gedan-barai and age-uke are at 90° to the opponent, Shotokan the gedan-barai is usually at 90° and the age-uke at 45°, Wado-ryu and Shito-ryu both gedan-barai and age-uke are performed at 45°. This would seem to be to target more to the front of the opponent rather than the side. i.e. make it easier to hit his neck. Opponent holds your right forearm with his left hand. Pull hikite with your right arm towards your right hip. Move round to the left of the opponent and strike down at his left elbow with the gedan barai, this will cause it to bend and fold. This also causes the opponent to bend over to the left. Stepping forward in zenkutsu-dachi places your leg to your right side of the opponent. 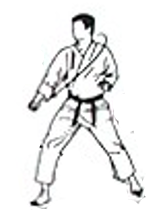 The left hand movement of the age-uke frees your right arm of the grip of the opponent and pulls hikite towards your left hip. The rising movement of the right arm in the age-uke strikes the opponent round the neck area, aiming approximately at the carotid artery. After hitting him, grip the opponent's hair or collar with the right hand. Rotate to the right pulling the opponent over approximately backwards.